One of the most life-altering complications that affects thousands of sepsis survivors is amputation of one or more limbs. Statistics show that there are over 1.6 million amputations in the United States every year; 10% of these are due to complications from sepsis. People who go into septic shock may develop small blood clots in their blood vessels, which prevent adequate blood flow to their fingers, hands, arms, toes, feet, and legs. The blood carries vital oxygen and nutrients and if the body’s tissues are deprived of these, they begin to die. April is Limb Loss Awareness Month, dedicated to raising awareness of this issue that too many sepsis survivors have experienced. When a limb is damaged because of tissue death, amputations are the last resort. If you develop gangrene, your surgeon may first try to remove just the dead tissue (debriding) if it’s not covering too large an area. The hope is the blood flow to the still healthy tissue will be strong enough to keep the area well nourished. Another treatment for gangrene is hyperbaric oxygen therapy. Patients spend time in an environment that delivers oxygen at high levels and the extra oxygen may encourage healing. But if debriding and other treatments like hyperbaric oxygen therapy aren’t options or they don’t work, amputation is the next step. When planning surgery, orthopedic surgeons study the limb or limbs to try to remove as little as possible, minimizing later disability. Some people may have only toes or fingers amputated, while others may have part or most of their leg or arm removed. Sometimes surgeons plan on one approach, such as a below-the-knee amputation, but once the surgery starts, they may see that there is too much damage and need to amputate above the knee instead. There’s no doubt that limb amputations change your life. 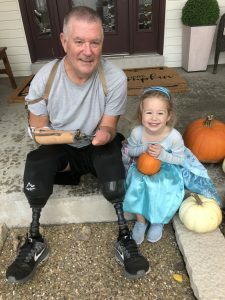 They require lifestyle changes for you and the ones you love, particularly when you are first learning how to use prosthetics or a wheelchair. But there are groups and organizations that may help you. If you are struggling, speak with your doctor, physical therapist, or occupational therapist about where you can get help. I- infection. There may be signs or a procedure that may have caused an infection. M- mental status. The patient becomes drowsy, confused, or difficult to rouse. It may not only save a life, it may save limbs. Previous Previous post: Alice C.